Previously – we tried to appease Kentucky and Pennsylvania while actually appeasing Delaware . . .
On to numbers 30 through 21 . . . I want to penalize Ohio for the BCS Title game in 2003 against my beloved Miami Hurricanes, but fair is fair, and I can live with a #30 ranking. Spectacular shoots are available in Ohio, but more often than not these are limited to private land. There is a good amount of public land available to hunt, but timing it right is sometimes the issue. Iowa has plenty of land, plenty of agriculture, and a number of rivers, meaning it has the perfect recipe for great waterfowling. In fact, it would end up a little higher on the ranking if not for the “star” duck component. Most of the waterfowling here is of the standard duck (mallard) and goose fare . . . I was surprised at the coastal duck hunting in the Palmetto State, including even some sea ducks. I was not surprised at the strong wood duck hunting in the marshes and ponds and backwoods. South Carolina has also been known to offer some surprise visitors, like Mottleds, Black Ducks, and Whistlers . . .
We really wanted to move Idaho higher on the list. Beautiful landscapes. Wild. Wonderful. And it holds it’s own on number of ducks, geese, the per hunter numbers, land, licenses . . . Unfortunately, it’s held back by not having a signature species. Besides the potato. There are some land limitations that create a few issues in access, but there are still a great deal of early season mallards and geese readily available. Plus, the scenery is incredible. The whole state is a giant cornfield. From this point forward, we’re looking at the upper echelon of waterfowl states, and Nebraska is no slouch despite the #25 ranking. Miles and miles of crops attract all manner of ducks and geese . . . The Cornhusker State has one of the largest assemblies of Sandhill Cranes in the country, but is one of the only Midwestern states where you can’t hunt these long-legged waterfowl. Tennessee has something very special when it comes to waterfowling. Waterfront property on the Mississippi River, and, obviously, the Mississippi flyway. Sure, we hear more about Missouri and Illinois and Arkansas, but Tennessee is no slouch. Reelfoot Lake is a legendary destination, and the state holds it’s own in number of ducks and enough geese to count on . . .
New York came in as one of the top spots nationally for Canada Geese. There’s a late season for snow geese, plenty of mallards, some coastal divers, and a few gems like Blacks or Cans have been known to drop in from time to time. Utah offers a ton of land for public consumption, as well as quite a few private jobs that are prime real estate. This is one of those states where you’ll see tons of late season limits consisting of all drakes, ready for the wall. Surprisingly, it’s also one of the best states for merganser hunting (talk about back-handed compliments, right?) . . . Mallards, teal, wigeon, redheads, gadwalls, and plenty of geese. When I think of duck hunting, I think of the Chesapeake Bay, bluebills and Cans buzzing in at decoy heights. Black ducks and greenheads and Canadas on snowy mornings. You can feel the history in the area when you are fortunate enough to spend a morning in the blind here . . . This was one of my bucket list hunts as a young hunter . . . 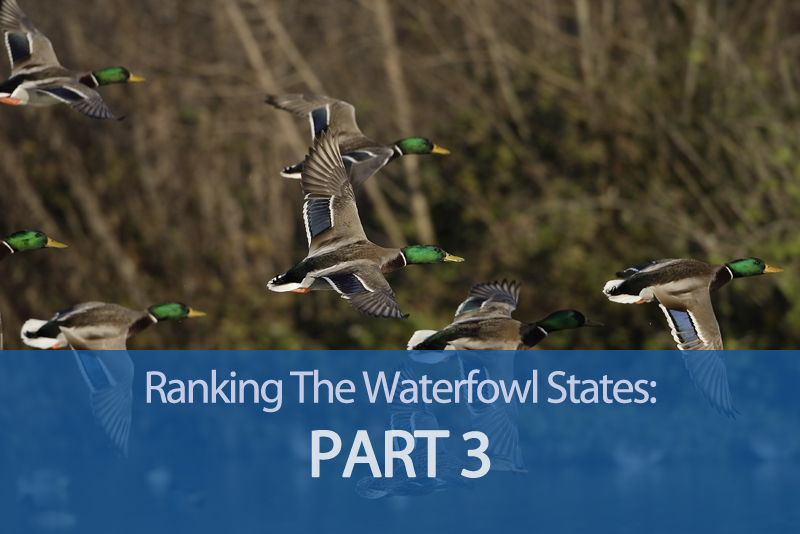 It did not disappoint and left me yearning to visit the Bay again . . .Continue to the top 10 waterfowling states here.